Welcome to Fibreglass4u we are fibreglass and gelcoat specialists based in East Anglia but within easy reach of all the major motorways which allows us to service almost anywhere from Southampton to Scotland. With over 24 years’ experience working within the fibreglass industry we have equipped ourselves with the latest technology to ensure the best products and services are offered to every one of our customers. We work in many sectors not just marine. From – industrial, construction, manufacturing and architectural our technicians, and their experience, are here to assist you. We can convert most designs into a fibreglass moulding or you may have your own production mould or prototype, we can work with that too. Whatever the complexity of your moulding you will find us amongst the most cost competitive within our industry. Please feel free to call us or contact us now for an outstanding service. We are able to repair most Gelcoat damage. We can colour match almost all colours, from small scratches to major repairs as well as providing professional cut and polishing. 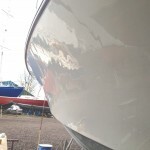 If the Gelcoat is in a non repairable condition or perhaps you just want to change the colour of your boat, we also offer a two-pack paint system. 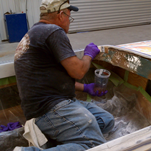 The two-pack paint system is flattened and polished to a high gloss finish. We can manufacture most shapes from GRP wether it is a special one off design or straight forward mould making. We are able to manufacture all parts in most colours to suit your requirements. We are also able to manufacture two part ‘closed’ moulded components. 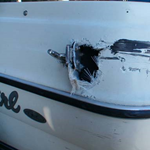 We can Fibreglass most shapes – from straight forward repairs to major damage as well as custom built parts. We can also Fibreglass manufacture one off components to suit your requirements or produce GRP production parts. Gelcoat is a polyester resin and uses MEKP as the catalyst. Gelcoat can be mixed in vitally any colour to match any existing gelcoats. It can by applied by spraying, roller or brush depending on what repair is required. Gelcoat has a long life compared to other paints on the market and can be repaired and feathered in on local damage leaving virtually no trace of the repair. We use a two pack polyurethane top coat that provides a high gloss finish with excellent weather resistance and very good gloss and colour retention. Ideally this is used over an epoxy based primer. It is resistant to a number of solvents and various chemicals, it has good application properties and cures at relatively low temperatures. The paint we use paint is available in virtually any colour and is very durable – performing extremely well in the aggressive marine environment.